The sweeping yet intimate drama based on the best-selling novel by Lisa See, Snow Flower and the Secret Fan, tells the unforgettable story of two Chinese women whose friendship and love sustains them throughout their lives. Directed by Wayne Wang (The Joy Luck Club), the film, which takes place in 19th-century China, is a timeless portrait of female friendship. The original motion picture soundtrack is composed by Academy Award®-winner, Rachel Portman. 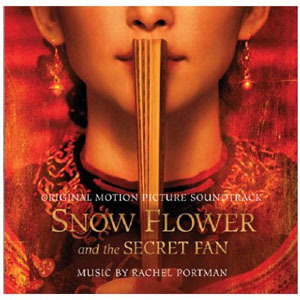 British composer, Rachel Portman, best known for her film work (The Joy Luck Club, The Cider House Rules, Chocolat), was the first female composer to win an Oscar® in the category of Best Original Score (Emma) in 1996. She has previously worked with acclaimed directors such as Roman Polanski (Oliver Twist), Norman Jewison (Only You), Jonathan Demme (Beloved, Truth About Charlie, Manchurian Candidate), Robert Redford (Legend Of Bagger Vance), Mike Leigh (Life Is Sweet) as well as countless others. In 2010, she was honored at the BMI Film & TV Awards with the Richard Kirk Award, which is bestowed on composers who have made significant contributions to the realm of film and television music, and she was the first woman composer to receive the honor.